The US Naval Institute Proceedings has a short discussion of two possible replacements for the Navy’s Cyclone class PCs and the Webber class is one of them. These might help us in the Caribbean and Eastern Pacific too. Don’t neglect the comments. Some good points there. This entry was posted in Fast Response Cutter, WPC by Chuck Hill. Bookmark the permalink. Taking a naval auxiliary hull and converting it to a warship is tough enough, without making assumptions that are not based on facts. The JHSV nee T-EPF was NOT meant as a testbed for the LCS. The class was and is a intra-theater sealift ship nee transport. While the T-APF does have good capacity and internal volume, it does not have the tankage for long patrols. In point of fact the original operating profile was for 96 hour long missions. 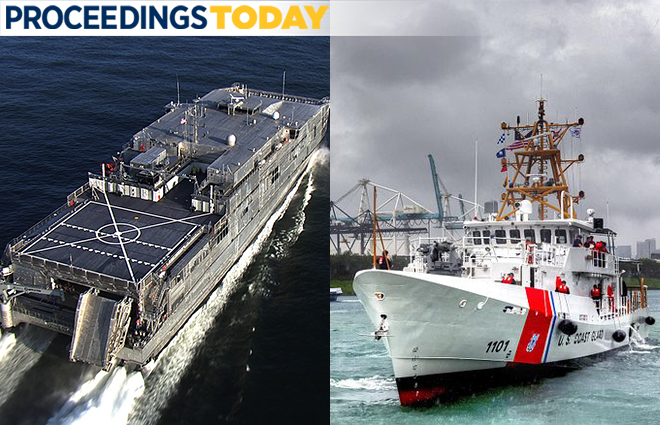 Since the JHSV need T-EPF are built to ABS HSNC construction standards, they don’t comply with the survivability requirements of the Naval Vessel Regs. Can a T-EPF be converted into a USS warship – yes with difficulty and great cost easily $75 million depending on how many NVR and MILSPECs are invoked? A better approach would be to modify one ship so as to be typed a Armed Naval Auxiliary. Modified MSC T-Ship rules. And adjust its offensive capabilities to meet that of an non-combatant. Then see how that performs. My only thought is maybe the JHSV would work for drug patrols in the Gulf of Mexico and the Carribean? They wouldn’t need to be uparmed much, probably just some stabilized 50 cals. I don’t know what the endurance requirements for those missions is though. The FRC might be a good starting point (hull and propulsion) for a PC design, but the weapons/sensor fit is different for a Navy PC, and the FRC has some endurance issues, which have been discussed here before. Might be cheaper to modify the FRc, but may be an opportunity for fresh look at mission needs and design from scratch for not a whole lot more money. It was not a JHSV/T-EPF but it was similar. Even so, it did not sink and the hull did not burn. Multi-hulls actually have some advantages in terms of survivability. When one hull starts to sink, the normally out of the water section joining hulls is lowered into the water and provides buoyancy (depending of course on how the hull is sub-divided. The endurance issues of the FRC are a result of outfitting decisions, not issues with the fuel capacity so I think they could be resolved relatively easily. I don’t think it would be too difficult to arm the FRC as the Cyclone class is now, adding a second Mk38 aft and some SeaGriffins. I suspect they would want any replacement to have Hellfire missiles.